Laboratory Applications | PLX Inc. Many types of laboratory experimentation setups, such as laser delay lines and ultra-fast phenomena research, utilize PLX Omni Wave Hollow Retroreflectors. 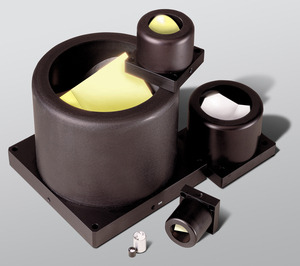 Omni Wave Hollow Retroreflectors are also commonly used for distance measuring applications or range finding. Long-baseline laser strainmeter (LSM) in Kamioka uses PLX 15” clear aperture Hollow Retroreflector. The strainmeter is a highly asymmetrical Michelson type interferometer. The long arm will be 1.5 km in length and will be in an evacuated beam tube. This will be the longest LSM in Japan and one of the largest in the world. As part of the Geophysics interferometer, PLX manufactured a 15” clear aperture Hollow Retroreflector of 0.5 arc seconds accuracy for the University of Tokyo Earthquake Research Institute. The instrument was mounted on a super-invar custom-made bracket and utilized PLX light-weighted optics technology. PLX also participated in the original "100 meter interferometer" with our standard 2.5” CA, 0.5 arc second OmniWave Retroreflector. The extreme accuracy of Omni Wave Hollow Retroreflector™ makes them excellent instruments for laboratory and range finding applications. Because they provide single surface reflection by nature, no offset for refraction is produced, as it would be when using a solid type prism Retroreflector. In addition, the single surface reflection allows for a wide variety of coatings for every possible wavelength. 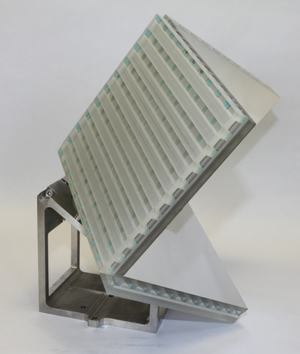 PLX Hollow Penta Mirrors™ and Hollow Penta Roof Mirrors™ Assemblies meet and exceed the performance of a Penta prism. Unlike a solid prism that is limited by wavelength transmission through glass, this device utilizes front surface reflectance, so it is unlimited in wavelength transmission. The Hollow Penta Mirror Assembly is available in two versions. Type PM displays an unchanged image after the image is turned at 90º. Type PR displays a mirror image after the image is turned at 90º.